The wings you might hear flapping when you first see The Hobbit: The Desolation of Smaug aren't those of the titular dragon. They are the many problems with turning J.R.R. Tolkien's short kids novel in to a bloated blockbuster trilogy coming home to roost fully. If you think that's a cheesy way to start a critical movie review, well, just wait until you have to endure the second part of director Peter Jackson's outsized jaunt back to Middle Earth. I actually liked the first installment in this trilogy, An Unexpected Journey. I know that's not a particularly popular opinion, but where many others saw a plodding story, I was able to find something that was true to the tone and spirit of the Lord of the Rings films, if not quite as consistently entertaining. The introduction of a younger Bilbo Baggins, played by Martin Freeman, was an unbridled success. So too was pairing him a company of 13 proud dwarves on a quest to reclaim their kingdom underneath the Lonely Mountain. But somewhere between the Carrock and Lake-town that momentum fizzles, swallowed whole by what amounts to an exhausting three-hour chase punctuated occasionally by lame attempts at humor from the dwarves. Apparently the whole gang, with the exception of Thorin Oakenshield, became caricatures of themselves somewhere between An Unexpected Journey and The Desolation of Smaug. You won't be bored per se. 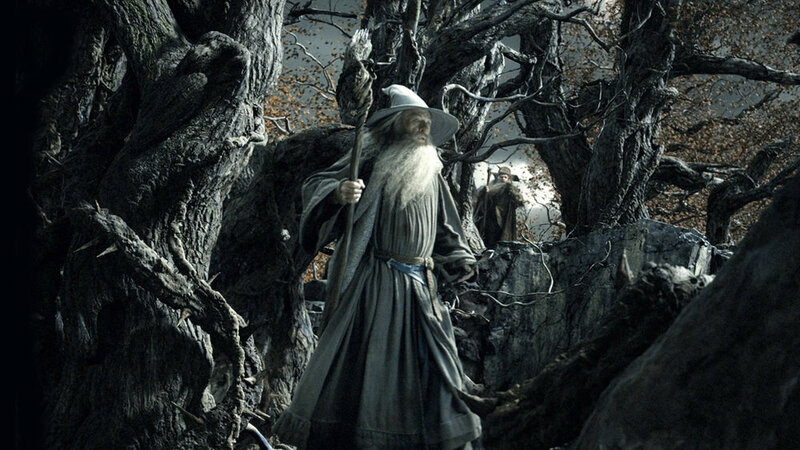 There is relentless action from the start as Bilbo, Gandalf and the dwarves cross paths with a skin-changing being named Beorn and then duck in to the dizzying Mirkwood Forest as they try to keep ahead of a pack of pursuing orcs. It is there that they are first saved and then imprisoned by wood elves, among whom is the familiar Legolas (Orlando Bloom) and the unfamiliar but apparently important Tauriel (Evangeline Lilly). The brood's escape -- down a river in wine barrels as the orcs resume their pursuit -- is one of the two best scenes in the movie. The other comes when Bilbo, the gang's de facto burglar, enters the Lonely Mountain alone and faces off with Smaug in an attempt to steal the Arkenstone, a gem of critical (but unexplained) importance to Thorin's bid to reclaim his rightful throne. This scene probably feels even better than it is because, after the rat-tat-tat-tat of action sequences through Mirkwood, Dale and up the Lonely Mountain, it finally puts two of the film's best actors (Freeman and Benedict Cumberbatch, who voices Smaug) in a room and let's them just, you know, talk to each other. Viewed in another light, though, it highlights the two deepest flaws of the middle entry in this trilogy -- the complete lack of meaningful character development and the befuddling marginalization of Freeman's Bilbo for much of the film. It shouldn't take this long to let Freeman do more than utter a few words and look charmingly confused, Cheesy lines and chase scenes that test the boundaries of your patience have always been a hallmark of Jackson's vision of Middle Earth. But taking hardly a minute to get to know his characters has not. Turning Bilbo into a passenger for much of the film seems particularly egregious because hobbits -- be it him or Sam and Frodo in Lord of the Rings -- are the beating heart of Tolkien's world. It's the good hearts and surprising courage of the Bagginses that keep us interested. This is driven home in scenes like Bilbo's battle of wits with Gollum in An Unexpected Journey. It's an amazing moment because when Gollum tries to solve Bilbo's final riddle -- what he's carrying in his pocket -- and fails after three guesses, the former never suspects the latter of simply lying about the contents of his jacket. There's a subtle but powerful message in Gollum's trust. Even to a miserable wretch like him, the idea that a hobbit would lie never crosses his damaged mind. This is part of the reason why we so adore hobbits. Sadly, The Desolation of Smaug drowns out subtlety at every turn (probably because it mostly muffles Freeman himself). It might not have the pacing problems of An Unexpected Journey, but at least you could easily identify the basic point of the latter. The Desolation of Smaug seems to exist purely for the sake of a few (admittedly excellent) action sequences and, of course, to make Peter Jackson even more money, so what if your Middle Earth oatmeal is being stretched with sawdust.